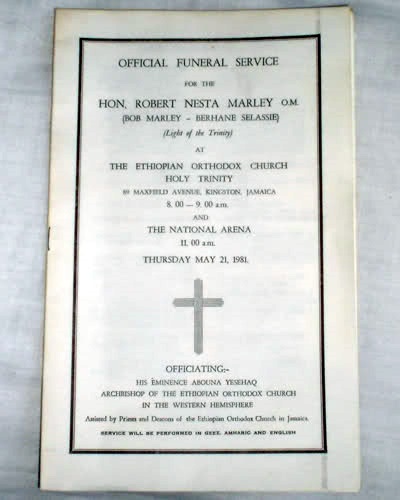 In honor of the 35th anniversary of the passing of Bob Marley, who finished his life as a member of the Ethiopian Orthodox Tewahedo Church (his baptism was just six months before his death), we’re reposting this piece we posted in 2010 (with a few additions) featuring the program from his funeral in Jamaica. Memory eternal! Journey To Orthodoxy yesterday ran a piece about the conversion of reggae artist Bob Marley to the Ethiopian Orthodox Tewahedo Church (a non-Chalcedonian church very similar to but not currently in communion with the [Eastern] Orthodox Church). It’s worth a read. We thought it might also be of interest to see this primary source document pictured above which also witnesses to his 1980 baptism—at which he took the name Berhane Selassie (“Light of the Trinity”)—and subsequent burial in 1981 by the Ethiopian Orthodox in Jamaica. HON. ROBERT NESTA MARLEY, O.M. Below is some footage from his funeral and the events surrounding it. Ethiopian Orthodox clergy are visible at several points.